Dales gloves from The Dales Countryside Museum. PHOTO CREDIT: Belinda May. (These gloves were originally pink and cream). I reverse engineered these some time back, from the originals. The pattern is just discernible “in the wool”. Here are the upper and lower case alphabet charts, I use for knitting Dales gloves. They could be used for anything where you need letters that are only a few rounds/rows deep. These are trickier to figure out than alphabet charts where you have a few more rounds for manoeuvre. Thought I’d share them here, as there’s not much like them, online. Some of the lower case letters in particular are straightforward copies of ones on extant 19thC gloves. Others, I had to make up “in the style of”. Click on the links to see as PDFs. Feel free to use these. 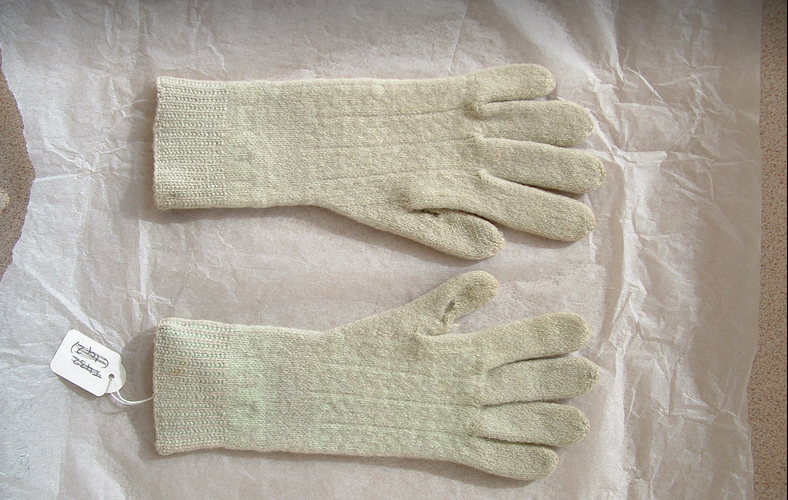 The gloves pictured are a child’s pair, with the name “Mary” on the welt. I decyphered them several years back but have yet to publish the pattern. There will be ‘Mary’ glove kits available at ‘The Luddites’ stand at the British Wool Show and the Armley show, both in June. And I will get on with publishing the pattern on Ravelry – promise! The sun came out, so yesterday I washed about 1lb of fleece for the ‘Spinning For Beginners’ Workshop, here at the Farming Museum this weekend! In the morning, we have our first ‘Like Fair Isle… But Yorkshire!’ workshop, which is going to look at Yorkshire two colour knitting. The spindlers will be trying their hand at spinning wool from our prize-winning flock of Badger-Faced sheep. As you can see, the fleece I unrolled yesterday is nice quality. These crimpier staples come from the neck – where you usually find some of the best wool on a sheep. I have put in some of the first quality, and a little of the second (as well as some of the darker staples, for a bit of variety). The second quality will be easier to learn with – but our spinners can take some of the first quality back home with them, to continue to practice. We’ll be spinning with hand spindles. Come and join us if you’d like to learn how to spin on a spindle, or have tried before and can’t quite get the hang of it. This is a breed I’ve never spun before, so am looking forward to it!